How Do You Improve During the Season? Good players typically prepare themselves during the off-season. This does not mean that you should stop conditioning and training during the season. Here are 5 tips that can help you maintain and even boost your in-season basketball skills. Resistance exercises are a great way to keep your game upbeat. These exercises require no equipment and can be done anywhere. Manual resistance exercises are a good tool for enhancing strength. In manual resistance exercises, a partner or a spotter applies resistance instead of using weights like dumbbells. A player needs to push or pull against the tension that his partner or a spotter provides. The goal is to resist the tension so that it helps boost your strength. Basketball push-ups – this workout helps boost a player’s strength and endurance while increasing capacity and power. Seated row – this exercise works your upper back and typically promotes stamina and power. It is also proven to loosen muscle stiffness for flexibility during a game. Barbell curls – this is a good training exercise for targeting the biceps. Biceps are used with repetition especially when shooting and passing the basketball. They are important for strength and power when playing offense and also defense and are used to help you gain position on the court. Forward and lateral lunge – this useful exercise routines help enhance a player’s agility, and flexibility. Basketball woodchoppers – this is a good conditioning drill that is best for intensifying speed, focus, and leg strength. Basketball is a strenuous sport which may sometimes cause muscle tightness. Players can reduce the risk of muscle tightness by performing dynamic flexibility exercises. These types of exercises can help a player maintain muscle flexibility. Dynamic flexibility exercises can help players loosen up prior to a practice or a game. These exercises can enhance blood flow throughout the muscles. This, in turn, helps loosen and warm-up the muscles giving the player more flexibility. Players who do dynamic exercises tend to move more swiftly and smoothly during a game. Dynamic flexibility exercises use sports-specific movements that can boost body functionality. This type of exercise is safe for anyone to do. It also maintains a good range in motion for joints. When there is reduced or eliminated muscle tightness, the energy level is increased and optimized. Hence, this can give players better chances of performing well on the court, allowing him or her to play at a higher level with more endurance. One of the most important elements in basketball is handling the ball. Whether dribbling or passing the ball, ball-handling is important in offensive and defensive plays. A player’s ability to handle the ball very well will differentiate him or her from the rest. This drill trains the hand-eye coordination and helps you become more confident when handling a basketball. Ricochet is a simple drill which you can do anywhere. You can start by standing with your legs spread a bit wider than your shoulders. Holding the ball in front of you, bounce it at a 45-degree angle between your legs. Make sure to catch the ball behind you. Continue by bouncing back the ball between your legs and catching it in front. As you get the hang of it, try to increase the speed and develop a rhythm. This ball-handling drill is a good for enhancing hand and eye coordination. 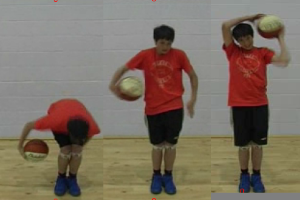 Start by wrapping the ball in a circular motion around your ankles, around your waist, and around your head. Do the same from head to ankles. Repeat this for a couple of times and increase your speed over time. This drill is aimed at increasing speed and focus. The scissor drill is a good technique for distracting your opponents while protecting the ball. This ball-handling drill is also great for developing your change of direction ability on the court to keep your defender on his or her heels. Similar to Ricochet, bounce the ball back and forth in between your legs. Modify by changing your leg positions while jumping but maintaining your leg angle at 45 degrees. This basketball drill helps improve a player’s dribbling techniques while fostering agility and focus. This technique entails the use of two basketballs and a wall. While facing the wall, dribble the basketball in each hand off the wall with small quick dribbles, keeping both basketballs above your head and arms extended. Dribble simultaneously and focus on using your fingertips. While it is true that training exercises can help you become a better player, it is also worth noting that you are a human, too. You are not a machine that can operate for 24 hours. You are a person who is entitled to rest. Never be afraid to call it a day. After all, you can always continue training the next day. Players can sometimes overwork themselves. This is the very essence of knowing your limits. Training is a progressive activity. You can always increase your limits on a regular basis. Rest if you must! The best way to get a good rest is to have enough sleep. When you lack sleep, you tend to be sluggish. This is also true when you over-sleep. It is always best to have the right amount of sleep. Players who get about 8 hours of sleep tend to show energy, focus, and strength when they hit the court. Regular meals and fluid intake keep the body strong and healthy. Playing sports like basketball requires you to maintain good health, strength, and focus. Eating the right kinds of food and drinking water helps maintain and boost your overall well-being. Maintaining a balanced diet comes hand-in-hand with a good training. Proper hydration, on the other hand, can help boost flexibility in your muscles. When a player observes the right diet and hydration, it will give superior strength and energy that will surely show on the court. Basketball in-season competition can be very rigorous. Players should keep themselves ready, healthy, focused, flexible, and strong to face all challenges on and off the court. Players can adopt a training plan to help them maintain their skills and fundamentals during the season.